MIAMI, March 22, 2019 /PRNewswire/ -- Just in time for Miami Music Week 2019, Denial Events announces a joint venture to further develop Denial Management, an artist management company with a fresh new approach to the industry. A 'dream team' of managers and artists are being announced as part of this new venture. Guido Weijerman, an Experienced Artist Management Specialist with a demonstrated history of working in the entertainment industry leads the charge, with Denial Events founder, visionary and CEO Christian Parth closely by his side. Parth is obsessed with pushing the needle forward, innovation, and top-shelf thinking, making him an ideal candidate to head up a revolutionary management operation. Denial Events COO, Rafi Leibowitz, will also play a key role in the rollout of DM (Denial Management) bringing his plethora of experience on the event planning and talent buying side into this space. Nightlife in Miami has reached an apparent plateau, and everyone has taken notice. Even as the world famous Miami Music Week approaches, boasting goliath DJ lineups spanning a 7 day period, showcasing the world's best talent at some of the best venues, those on the ground year-round can't help but feel that the local scene has fallen somewhat flat, becoming stagnant and predictable. The absence of the true top-shelf experience is affecting the bottom line of the nightclub industry and contributing towards its demise. Enter Denial Events, whose mantra is to redefine not only the VIP party-goers experience, but to reinvent artist programming, forcing innovation and forward thinking to once again carve out the memorable journeys into the abyss that we used to know and love, but struggle to come by very often. Examples of this aforementioned boundary pushing can be found throughout today's Denial Music Week announcement. Denial Music Week now houses all 35+ events, parties, and experience offerings the company has produced this year. While there may be lingering uncertainty surrounding Ultra Music Festival and its new location and hours, there can be no uncertainty here. Denial Events is for real, and have established themselves as a main (if not the main) experience creators in South Florida. Expect to come across talent such as Dada Life, Gorgon City, Sam Feldt, EDX, Paul Oakenfold, Aly & Fila, Simon Patterson, Ghastly, Bonnie X Clyde, What So Not, Justin Jay, Deorro, Dom Dolla, Sonny Fodera, Firebeatz, Chocolate Puma and many, many more. Denial Events is not only bringing back the intimacy and energy so often missing in the major nightclubs, but as of today has announced that they will be developing Denial Management, a management company born on the premise that artists in today's society are often misrepresented, neglected, and far too often, get sucked into the 'black hole' of the inner workings of the industry instead of being placed in the best position possible to showcase their talents and achieve self-fulfillment. 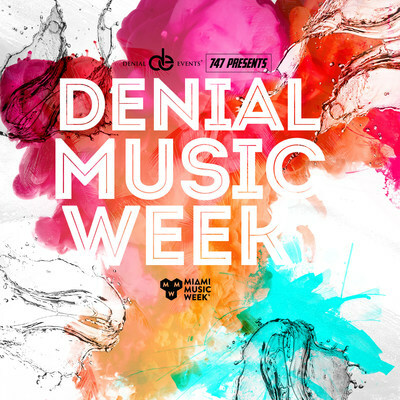 All info on Denial Music Week, a full list of shows, and ticket links for all can be found at www.DenialMusicWeek.com. Press availability is limited but available. Please direct all such inquiries including interview requests to rafi@denialevents.com.